There have been trial studies done that show, eating a Mediterranean Diet and Exercise combined, lower the risk of Alzheimer’s. In a previous blog I discussed in detail the Mediterranean Diet. However, in a nutshell it’s a lifestyle approach to healthy eating that includes a balanced variety of foods and daily exercise. Most of us know someone who has Alzheimer’s or have friends whose parents or family members have been diagnosed with it. If you could know ahead that eating a healthy diet (Mediterranean) and exercise could possibly prevent you from getting this disease wouldn’t you make the effort to follow it? Here is the link to the article that I read that I think you will find interesting. Please share this with others. However, if someone you love has been diagnosed with Alzheimer’s and you are unsure how to care for them please check out this site, that offers in-home assessments for those with dementia-related illnesses and solutions for aging-in-place. Remember, exercise makes you feel great and eating a Mediterranean Diet nourishes your body. The two combined will do wonders for you and those you love, plus ward off many diseases. To learn how to cook the Mediterranean way, contact me to schedule your Mediterranean Culinary Class. In the meantime, to help you get started, try this great summer chilled soup recipe. This light, no-cook soup is a great base for endless possibilities. Try it with croutons, chopped vegetables or cooked shrimp. Place the tomatoes, onion, oil, vinegar and tomato puree in a food processor or blender and blend until smooth. Pour into a bowl and stir in tomato juice, cucumber, green pepper, salt and pepper. Chill thoroughly before serving. I have an aunt who has been diagnosed. My mom and her siblings are helping to care for her. It’s such an sad disease. Thanks for the post, great information and very useful links. I’m glad you found it helpful. I thik we all know someone with the disease. Please pass this information on to someone else that might find it beneficial. Tina I agree with you. We can never go wrong eating a healthy diet with exercise. Lots of fruits, vegetables, fish and plenty of water. It truely does give you more energy and makes you feel better. Then throw in a candy bar or some fried food and it immediately drags you down. If we listen to our bodies when we eat, it tells us what’s good for us and what’s not. Eating right with exercise is the key to a longer healthier life, in my opinion. I never said I eat perfect. I love my sweets but definitely can tell when I eat too much I am ready to crash. I never turn down chocolate. My Mom passed away 7 years ago from a related but much less common brain disorder so we do try to eat along the lines of the Mediterranean diet. Also, I have replaced all of my non-stick cookware with cast iron or enamel because the non-stick coating has also been linked to these horrible brain disorders. 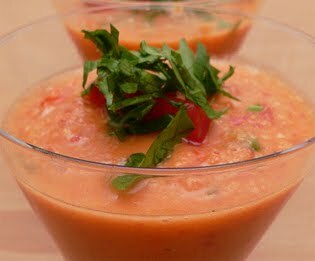 I love a good Gazpacho, but I usually have to cook it because my hubby can’t eat raw onions but I do like the simplicity of your recipe and isn’t that the best way to cook?